Whether you need a curved monitor for the ultimate viewing experience, would like a screen that offers 4K or require a specialised monitor designed for gaming, there's guaranteed to be something perfect for you within our selection of 27-inch iiyama monitors. Packed with the best specs, you won't be disappointed by iiyama. Fast, efficient and boasting vivid colours, the monitors are ideal for home or office use. These big screen models are perfect for watching movies and TV shows too, and wall mountable options can be great for using at work during presentations. 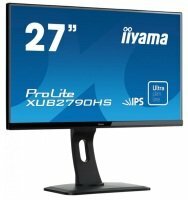 Browse our selection of affordable 27-inch iiyama monitors today.